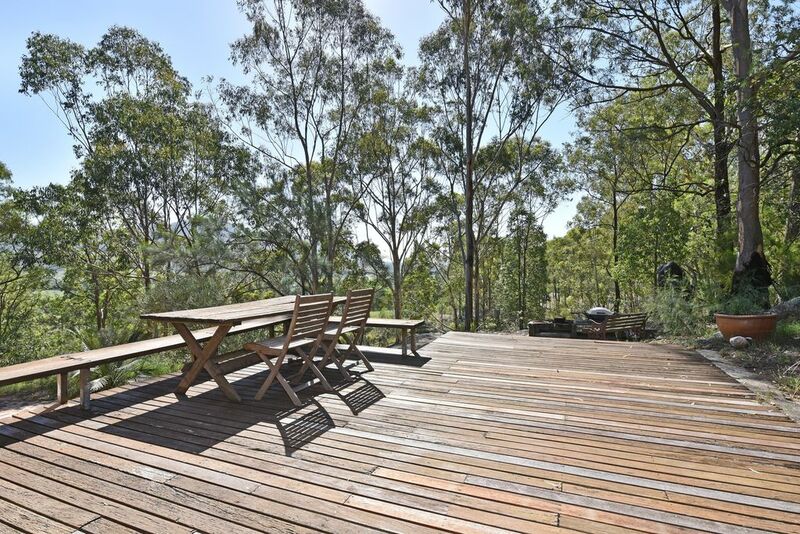 The cottage is on 100 acres of paddocks and bushland, surrounded by vineyards. Because the cottage is in a beautiful Australian bushland setting, you have many opportunities to observe native flora and fauna, and if you are really lucky, at certain times of the year, some unusual Xmas beetles and other insects and perhaps small geckos may drop in. "So very glad to stay once again at Kim's Cottage. We've now experienced this home during two very different seasons i.e. winter & spring and each one has its own appeal. Will return again for sure." "We have fallen in love with this little organic cottage. I feel regenerated, relaxed and remarkably well. The erotica in hidden corners is gently exciting, the wildlife at sunset is positively divine. A truly lovely experience." "Thanks for offering such a beautiful experience in Hunter Valley. We loved the earthy decor and natural surrounding (waking up to the cuckatoos near our bedroom). Thanks Eden for making this weekend magical!" "Just love it and hope to come back, had the loft room wish I had the same at home. Thank you very much for the big chill out." "Peaceful, tranquil oasis. Lovely home. Thank you!" "Even in the pouring rain, we still had a wonderful stay. Thank you so much for an incredible experience." "We loved our stay. The middle of winter with the fireplace blazing at night is so hard to beat! Loved the unique feel and the many artworks around the place. I can now say I've been head (sculpture) hunting in the Hunter! Thank you for your hospitality and that nothing was too much trouble!" BOND A bond of $100 is required to secure the booking. If paying by credit card, the bond will be applied to the card IF REQUIRED. Your approval for this action is implicit and verified by the confirmation of the booking. A deposit of to the value of 30% of the booking fee is required to confirm the booking - refundable if the booking is cancelled 2 weeks or more before the booking date. Full refund available if cancelled 2 weeks or less before the booking date only if the accommodation let to another guest. This was an amazing find. I love staying at different styles of places and this one had it all. So much character. Beds were comfy. The place was beautiful. Well equipped kitchen. We enjoyed playing some board games. Broke is also a lovely area. We stayed here in early Jan 2016, and ended up leaving early (losing money in the process). Very disappointed by the state of the house: extremely poor lighting in kitchen -the caretaker and companion visited and agreed with us, but didn't do anything to fix it -- I burned both hands due to darkness cooking at night. Found a huge ant nest under the toaster, a bit of a mess to clean up. No shower curtain in the bath (and no towel racks) so water goes everywhere, a mess. And wet towels. Poor lighting in the main living area, so difficult to read if cloudy or dark outside. This could be a lovely place, and our concerns/complaints have previously been noted in the book in the house, but it seems that the owner or caretaker don't care. Corymbia has been operating now for many years and this is the first time we have received a complaint such as this Nevertheless we have addressed those things that we can - such as shower curtain and lighting. The main reason Corymbia is so popular is it is nestled in the bush which means some visits by ants etc are inevitable. Ants do not 'nest' under toasters. It is important to get feedback from our guests so that we can constantly ensure Corymbia meets our high standards. The house is awesome as is the location but the spiders and cobwebs were really bad. They were everywhere. Had they just been cleaned up before our arrival our stay would have been far more comfortable. We counted 7 huntsman spiders in the kitchen on the first night which freaked us out. Also it was annoying that we couldn't leave the doors open to catch the breeze because the bugs that came in attracted to the lights was really bad. We also couldn't use the fan provided because it was so loud. We had ants and bugs in our bed and under our pillow. The window sill behind our bed was covered in a layer of dust and cobwebs. The bathroom flooded every time we showered also. This place has such great potential but it wasn't clean enough to have guests when we stayed. It's a shame because the location is beautiful! Wonderfully remote from civilization it has everything you need to escape the city. Approach through two gates and across paddocks, the house sits among the boulders and gum trees on the side of a hill. Off grid living with resident sculptures and complete solitude although you can glimpse the lush, farmed valley below through the bush. An open fire for winter, a wide deck for summer evenings and a covered veranda if it's raining. No TV, no Internet and limited mobile phone coverage (Telstra only, though there is a land line in the event of an emergency) completes the sense of escape. Resident bird life includes Kookaburras, Peaceful Doves with their distinctive call and Blue Wrens. Very close to Krinklewood winery and excellent restaurants at Margan Estate and Nightingale Wines an easy drive away. Comfortable bedding. The owners are very helpful and accommodating. A get away from it all location but with town facilities nearby. Dubbed the tranquil side of the Hunter, it is just that. I'll be back! Thank you for a fantastic way to explore the Hunter. we discovered some amazing local vineyards. Hope to stay again.